Wala ka cgurong jowa nor husband na may sense of humor 12:49. Boring. What they have are typical problems by almost every husband. Nothing new. No need to reply. She was once bullied by his wife along with her 2 friends in TI. 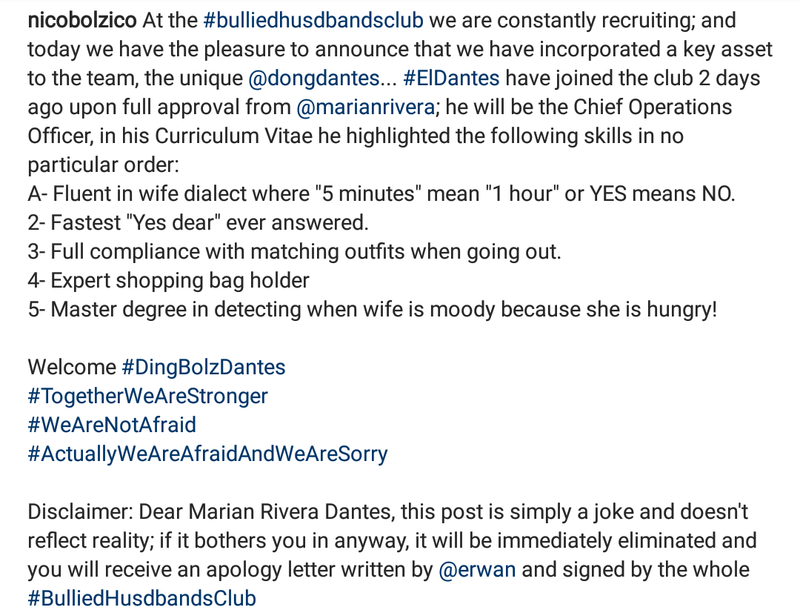 ang kulit ng post ni nico..haha.sino pa ba ang nsa bullied husbands club? For sure yung asawa ni Isabelle Daza. Hahaha! This is so cute. Love ko si Solenn & Nico. Mabait and warm to everyone kahit mga alta. True! My sister works in Hectare One and she has nothing but good words for this couple. Haha. 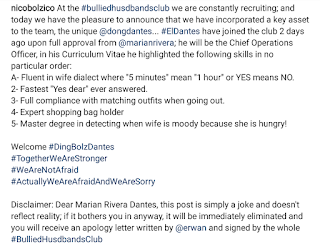 ‘Yung may takot si Nico kay Marian kaya may pa disclaimer pero si Erwan ‘yung inalay lol. Actually they are the goals husband squad! These are equally talented husbands of achiever wives! Nice to see them bonding with clean fun. Hahaha, good vibes. I am sure, fun ang club nila. Nico should have his own YouTube channel. Funny guy. LOL! I find this really funny! Ang corny sorry. Cringeworthy eeew. 12:44 ang corny ng post mo. cringeworthy eeew. The bullied husband club must have an important qualification, handsome husband, beautiful wife and true love and devotion for each other! 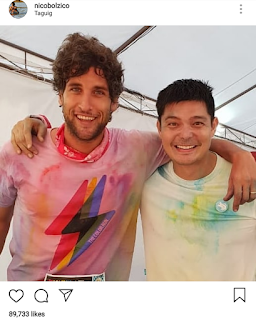 Relationship goals talaga si Nico and Solenn - gorgeous, smart, talented and downright nice people! Not surprised to see Nico get along with Dingdong.